DINO is a nine year old German Shepherd. He was brought to the UK from Spain as a young dog and has been with the same owner ever since. Unfortunately his owner has now been taken ill and is no longer able to care for him. 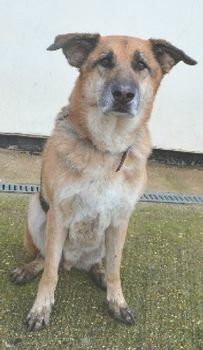 Dino is best suited to an adult only household with no visiting children as he can become protective. He is good with other dogs but hasn’t lived with a dog in the past. Dino loves to be walked but can’t be let off the lead and does pull, so will benefit from lead training. He is also prone to ear infections but as that is a known weakness PACT will continue to monitor and treat any further occurrences. As an older dog used to home comforts Dino is finding kennel life tough and we would love the right person to come forward and offer him a forever home in his twilight years.